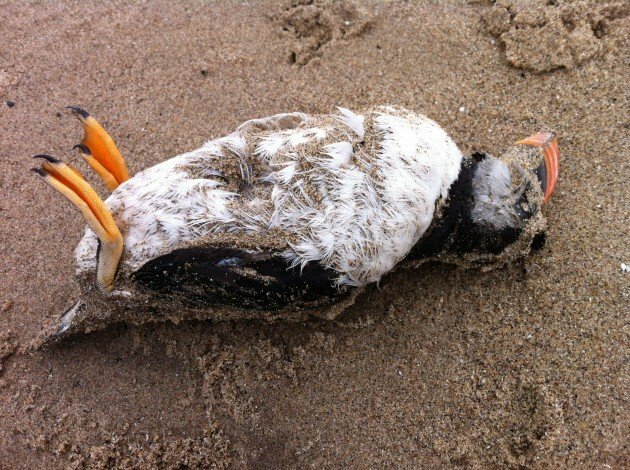 Are Atlantic Puffins in Trouble? Now, some scientists have started expressing concerns about the North American population of the birds, which is concentrated along the coasts of Maine and Canada. There seems to be an unfortunate series of events, as Lemony Snicket would put it, leading to the threat, with climate change as the ultimate culprit. That is, warmer oceans are changing fish populations, with butterfish beginning to supplant the herring that Puffins usually feed their young. But these substitutes are often too big for chicks to eat, and they may starve to death. Survival rates for fledglings appear to have plummeted from a five-year average of 77 percent to just 31 percent last year. Food instability also appears to be driving down the weight of adult Puffins, and delaying their breeding. Plus, scientists note that in some cases, extreme conditions in the seas have washed away the birds’ burrows. Die-offs and population drops of other Puffin colonies in the eastern part of their range, as well as among the terns of Machias Seal Island in Maine—a sharp decline in the number of returning birds, coupled with breeding failures—do not bode well for the Puffins. Scientists worry that climate change may outpace the birds’ ability to adapt, or drive the population far northward. For now, though, the Puffins have returned to Seal Island in Maine and are trying their best to raise healthy families. You can watch them in action through through Audubon’s Project Puffin webcams. (One is set up in a burrow, and the other is on the birds’ “Loafing Ledge,” which also attracts Razorbills, Guillemots, and terns.) There’s more about Project Puffin, as well as ways to become involved, here. Poor puffins! I went to the Audubon Society page, and made a wee donation; I wanted to pick the “adopt a puffin” option, and get the book, but I didn’t have enough money. I’ll post about it on my blog too, though. I’m sure every little bit counts and the puffins are (presumably) grateful for all the help they can get. Thank you for spreading the word too!